This fantastic space has been created on the first floor of the building and can be used as an alternative meeting or activity space for any club or event. 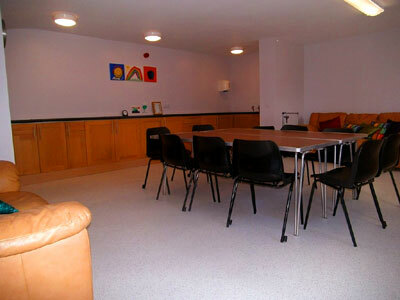 The room was created especially for arts and crafts and offers easy clean flooring and surfaces so that any user need not be concerned with splashes and spillages during an activity. Whilst offering a sizeable area for activities the room retains an intimate feel with a curved ceiling following the line of the original barrel vaulted roof. The room also comes equipped with fitted cupboards and work surface along one side, sink with hot and cold water, kettle, tea and coffee making equipment and crockery etc. The room has private access from the Foyer area, and a large walk-in storage cupboard.